Have you heard of financial therapy? No? You aren’t alone, but it is an important topic we need to be aware of. Kiné Corder shares with us what it is and why it matters. The one action you as a couple or family can take that will set you up for success when it comes to making difficult financial decisions. Growing up, Kiné’s family switched religions many times. This allowed her to chose her own church to attend. The church she chose was very open about prosperity, and metaphysics. In her younger years, Kiné’s parent both had six-figure paying jobs. They never really told her, or her siblings, no. Instead they would promise for later. This all changed during her 18th year, when both of her parents were laid off during the same season. At this time Kiné was making her own money, and had to rely mainly on her own earnings to get what she wanted; it was a big and scary shift for her family. Because of her parent’s experience, Kiné’s parents pushed her and her siblings into entrepreneurship. Because they were so focused on not repeating what happened to their parents, when they were around the same age as her parents were when they lost their jobs, Kiné and her siblings’ businesses crashed. Kiné believes this is attributed to the concept she learnt in church: what you focus on expands. Kiné started as a financial advisor. She felt like she was helping people, yet she could still see another burden they carried. She realized that most of the issues these couples were having were more than numbers. She wanted to resolve all of the couples’ issues, which lead her to researching financial therapy. Kiné returned to school, became a psychotherapist, and began her career as a financial therapist. As a financial therapist, Kiné helps her patients heal. She does so by first helping them determine their money program. Next she address her patients outlook on prosperity, which is often times influenced by their past money traumas (anything from having their house burn down to guilt resulting from money left by an ex-spouse). By addressing those past traumas, Kine helps her patients change their outlooks on money, and their relationships. Enthusiast: Not great at earning, growing, or protects, but gifts and enjoys their money. Enthusiasts are always looking for the next best thing. Blamer: Blames others for not having money. Most blamers have gone through trauma. In couples, pairings of these personalities can either benefit, or lose from each other. For example, if an enthusiast and a hero get together, they might ‘buy the bar’ for different reasons and end up spending too much; a bleeding heart. At the same time, the hero might push the enthusiast towards the next best thing. In order for any combination to benefit, the personalities must find their positives, and adjust their negatives in order to achieve money harmony. Marriage Money Mission is a program run by Kiné, which is held four times per year. Essentially, Kiné goes through each couple’s money cycle so they can create their idea of prosperity in each area on neutral ground. At the end, each couple must create a major statement saying how they will earn, grow, protect, gift, and enjoy their money as a family. This way, when an argument arises, the couples can go back to their money missions and solve their arguments. 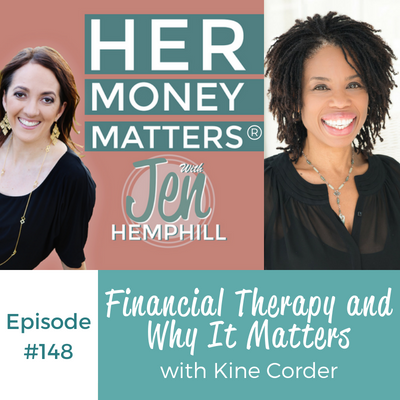 The post, HMM 148: Financial Therapy and Why It Matters With Kiné Corder appeared first on the Her Money Matters Podcast.